"Killer Instinct's mummy is the most unique character the franchise has seen yet"
Killer Instinct Season 2’s latest playable character was released last week and also the second newcomer to the franchise. There was something mysterious about the mummy Kan-Ra ever since he was teased back in October. Now he is out for both Ultra Edition and Combo Breaker Pack owners as his playstyle is unlike the current cast of fighters. Kan-Ra’s playstyle is described to be as a “trap grappler.” He relies on setting up sand traps and swarms to damage opponents. In other words, he is a defensive character that also has Dhalsim-like limbs to hit opponents from a distance and a command throw that can also lead to the auto/manual combos when used with sand traps and swarms. These swarms can be activated in the air to catch people jumping and lead into a tornado special opener as an example. The sand traps give Kan-Ra more mobility when he is on it to jump full screen or teleport to the opponent’s back. Some of his other sand trap moves also act as openers and the ability to curse the opponent, which their movements are slowed down for a limited time. That is pretty a lot to sink in because Kan-Ra is an unconventional fighting game character, but once you see all of this in action and mess around with him yourself. Kan-Ra is also not my style of character I use in a fighting game, but it was still a refreshing change of pace despite the steep learning curve compared to the rest of the cast. I would say he is the hardest character to learn so far in Killer Instinct, but if you like setting up traps and throwing opponents, then he is the perfect character for you. It takes more work than other characters to win especially because he doesn’t deal that much damage in normal auto/manual combos, but it depends on implementing his setups in an effective manner. Patience is definitely required to be at best decent with him because it has been a struggle for me in ranked online matches against the stacked competition. The Forbidden Archive is Kan-Ra’s stage and it also has a stage ultra where you can send opponents flying to a portal leading into another dimension. Mick Gordon once again did an amazing job with the music for this stage as well. The UI in the recent patch has been however slower to move through menus, so hopefully Iron Galaxy fixes that in another update later this month along with any Kan-Ra exploits and bugs people experienced. As the second original character to come to the new Killer Instinct and Sadira being the fist, Kan-Ra is a worthy addition to the current roster of fighters due to his unique playstyle alone. He plays the most different compared to everyone else because he prefers to be a distance setting up sand traps and swarms along with being able to throw opponents from mid-screen with his command grab. There is definitely a steep learning curve with Kan-Ra, but if you’re bored with some of the other characters because of their similar playstyles, then he’s worth trying out for a bit due to his change of pace in fights. One of the more beloved fighters from the original, Riptor, is slated to be December’s character for Killer Instinct and I can’t wait to mess around with this dinosaur. 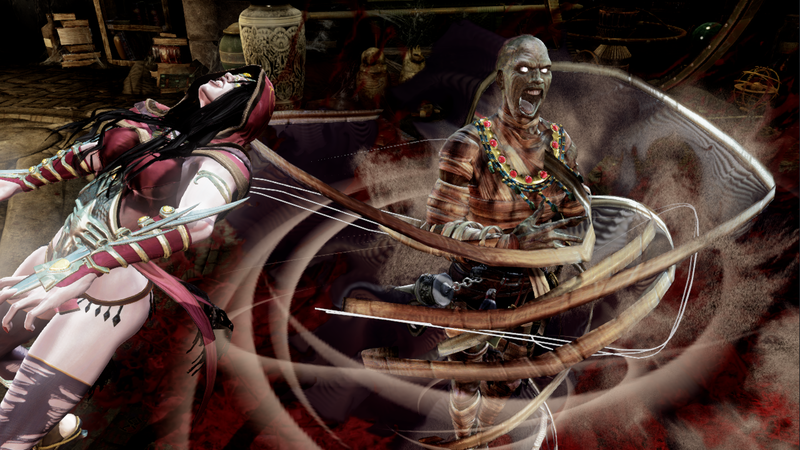 In the meantime though, Kan-Ra is out now for both payable editions of Killer Instinct Season 2 only for the Xbox One.